Remember when I did Pokka Oolong Tea and had basically “It’s canned Oolong tea!” to say about it? Well here’s Oolong’s sister Jasmine Green Tea and it…tastes like canned Jasmine Green Tea. These canned teas are the easiest JSFs to review in the history of JSF because if you had in your mind what canned Oolong or Jasmine Green tea should taste like and then opened one of these you would say “Yeah. That’s totally what I’m thinking about”. I once bought a box of Jacksons of Piccadilly’s Jasmine tea and Pokka’s canned tea tastes exactly like I brewed up a bag of J&P’s Jasmine tea. Of course, I wasn’t overly fond of the Jasmine tea and wound up giving most of the box to someone who was a genuine green tea lover so I’m not sure that’s a selling point. J&P makes a fine Russian Caravan Tea though so I can’t tell you whether they just make a poor Jasmine tea or if my dislike of green tea in general is to blame for my J&P Jasmine Tea ennui. I sort of blame the later as the tea wasn’t bad, just not something I really wanted to drink every day when the world is full of much tastier teas. And hey, if J&P made a Jasmine Green tea that I found drinkable by itself then it’s probably a tasty tea yeah? 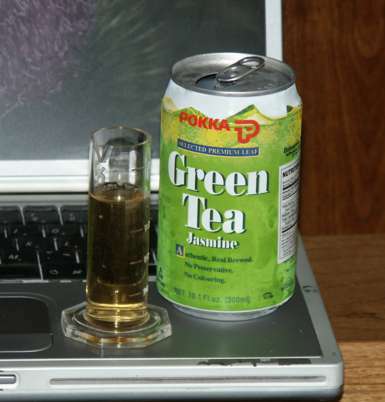 The only nit I have with Pokka’s canned Jasmine Green Tea is that it’s sweetened to within an inch of its life. Maybe I should have said that Pokka’s tea tastes like I brewed up a bag of J&P Jasmine Green tea and then accidentally dropped a box of Domino Sugar cubes in the cup. A little sweet goes a long way but a lot of sweet, I think, sort of detracts from the tea experience for this tea. I kept thinking this would be a better drink if it weren’t so sugary. It’s going to cost Pokka a half pea deduction for the oversweet but other than that, I’d give Jasmine the same rating as Oolong. of 3 Wasabi Peas out of a possible 5.